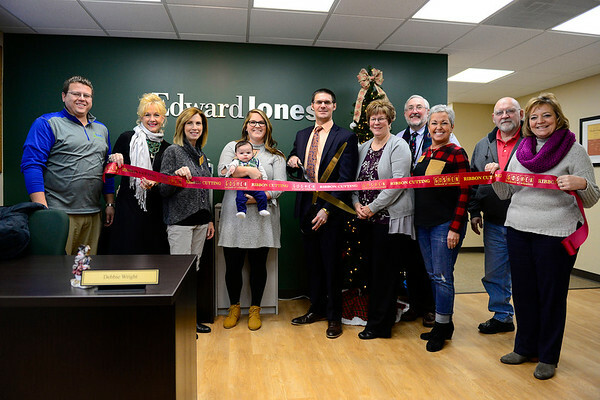 Ryan Drake cuts the ribbon at his new Edward Jones branch in Goshen, with, from left, Nick Kieffer, Sharon Welsh, Karen Lee, his wife Courtney Drake and their 2-month-old son Brooks, Debbie Wright, Mark King, Jill Garris, Jim McKee and Gloria Moser. Drake opened his new office at 1206 College Ave. in November after renovating the space for the past year. "We have the opportunity here to change peoples lives," Drake said.